Q. 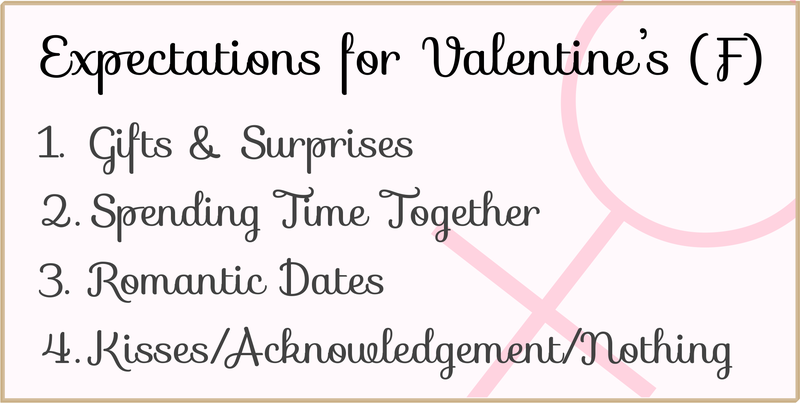 What would you expect a girlfriend/boyfriend to do for you on Valentine’s Day? 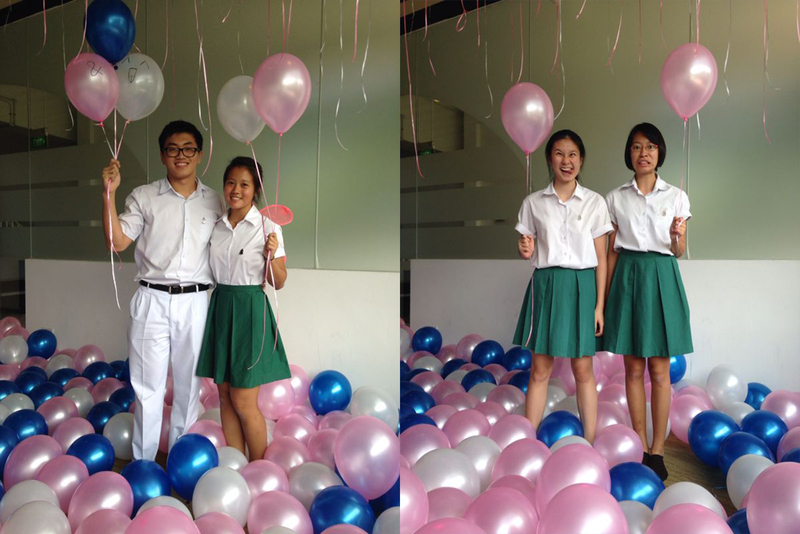 How did you spend Friendship Appreciation Day? Did you know that Valentine’s Day was originally a religious celebration of a Christian saint named Valentinus? The original festival had nothing to do with roses or chocolates – the only semblance of sentimentality was that the said saint carried out secret marriages for soldiers otherwise forbidden to marry. What then does the arbitrary retailers’ dream day mean today, beyond making most American men $150 poorer? And in particular, what does it mean to the average Rafflesian? In an attempt to demystify the unspokenly exciting day that might spice up an otherwise dull school life, Raffles Press presents to you an online survey of 120 respondents on boyfriends, girlfriends, expectations and reservations. Of the 120 people we surveyed, about 56% were girls and only around 26% were in relationships. A. Buy me chocolates! And spend time together with me. The first of our questions was ‘What would you expect your girlfriend/boyfriend (or hypothetical one) to do for you on Valentine’s Day?’. Girls are commonly stereotyped to expect more gifts and romantic gestures, and some may feel weighed down by perceived expectations from the day. But is this actually true? A. Not get heat stroke at Take 5. At first glance, it might appear that flowers, chocolates, and handmade gifts like cards and letters can commonly be found among the girls’ responses. Some wanted “personalised gifts”, others “self-composed songs”, while one slightly vague response hinted at the desire for “a romantic event”. Some girls seem to be more imaginative than others, providing us with more detailed descriptions of their ideal Valentine’s Day. One female respondent detailed that her ideal date would be to “go on a walk in some quiet nature place, like a reservoir, beach, garden or park and stone with me somewhere quiet and with no one, just looking at the scenery with a cup of tea~”. However, the generalisation of demanding girlfriends is definitely false, with even some of those in relationships not even expecting gifts. “I just expect him to spend time with me. No gifts needed”, said one. Out of 67 girls, the majority of 31 expected to spend some time with their would-be significant other on the special day, 27 expected some sort of gift if a small one, and the remaining minority didn’t expect anything at all. A. Wish me Happy Valentine’s? As for the guys, it would seem that some still hold the mindset that they’re not supposed to be on the receiving end. About ⅓ expected nothing at all, with one respondent even remarking, “I’m the guy. I should be the one doing something special for her.” However, contrary to popular belief, some guys did expect some sort of presents – one commented, “Write me a card at very least.” The majority of male respondents simply wanted to spend time together or hang out. As clichéd as it might sound, it seems that the best present is our loved one’s presence, regardless of gender. 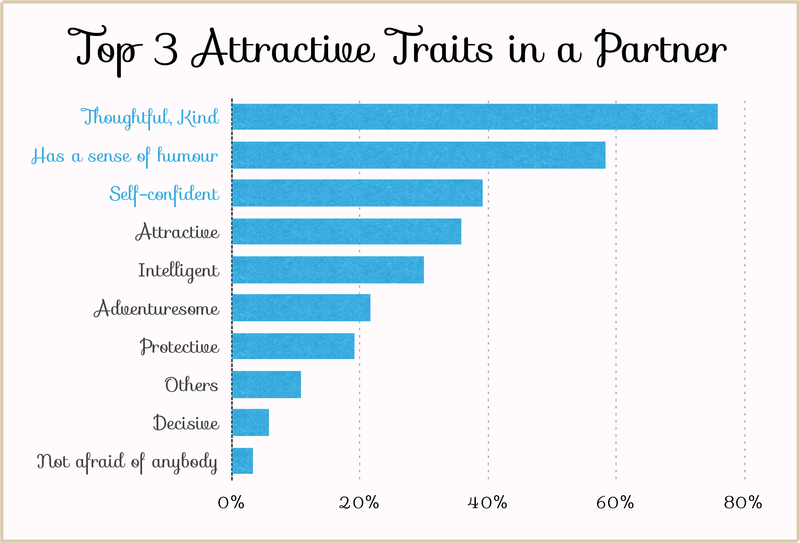 What our respondents could agree on, however, was that the most attractive trait was – thoughtfulness! 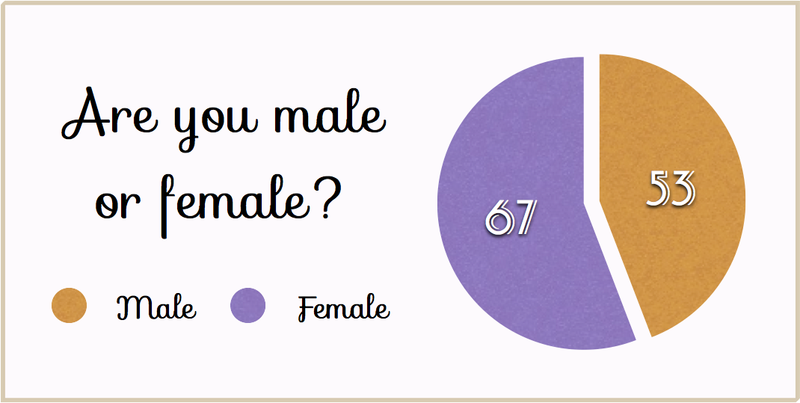 It topped the charts for both girls and guys, with almost 80% of responses. It was followed by sense of humour, which again ranked second unanimously by both genders. Following these two traits though, disparities between guys and girls’ preferences start to occur. 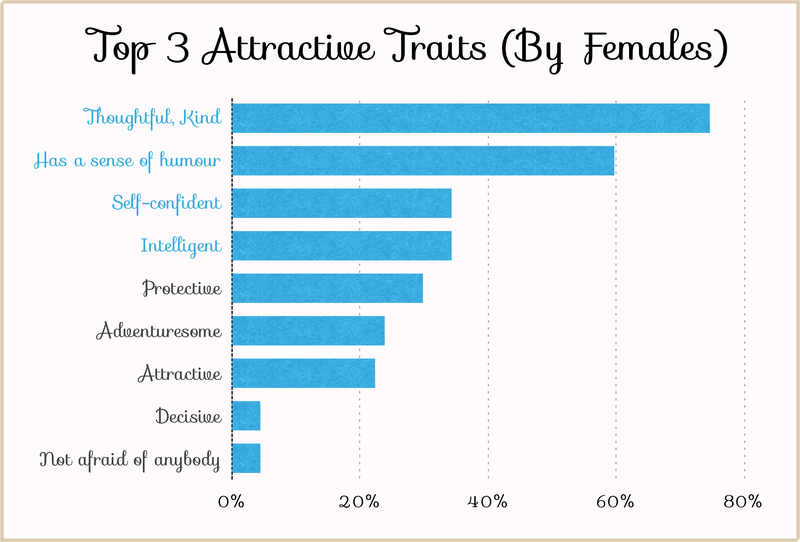 Attractiveness apparently plays a more important role in choosing a potential partner for guys as compared to girls. 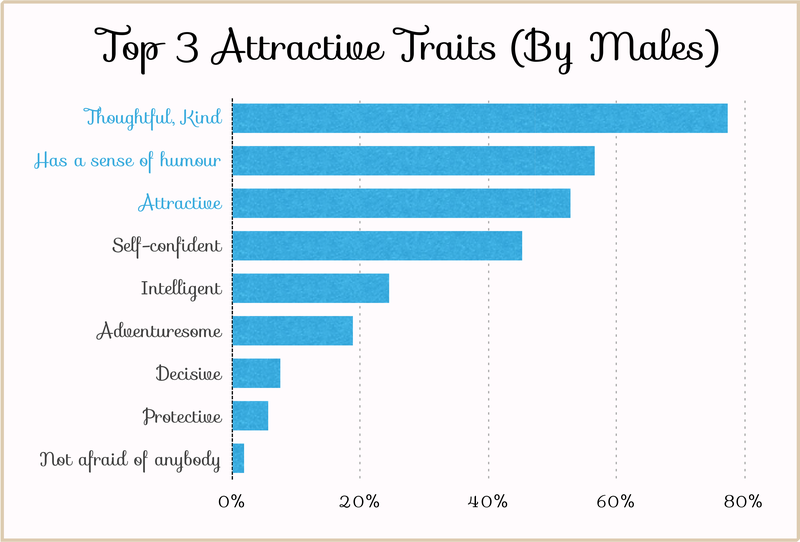 Attractiveness ranked third in the guys’ preferences, while it’s close to the bottom in the girls’ preferences. It does seem, however, that girls still prefer guys to be their knight in shining armour – protectiveness ranked relatively high in for the girls! It could also be assumed that Rafflesians are most interested in well-read and charismatic individuals, considering how both self-confidence and intelligence made it to the top five of the guys’ and girls’ rankings. 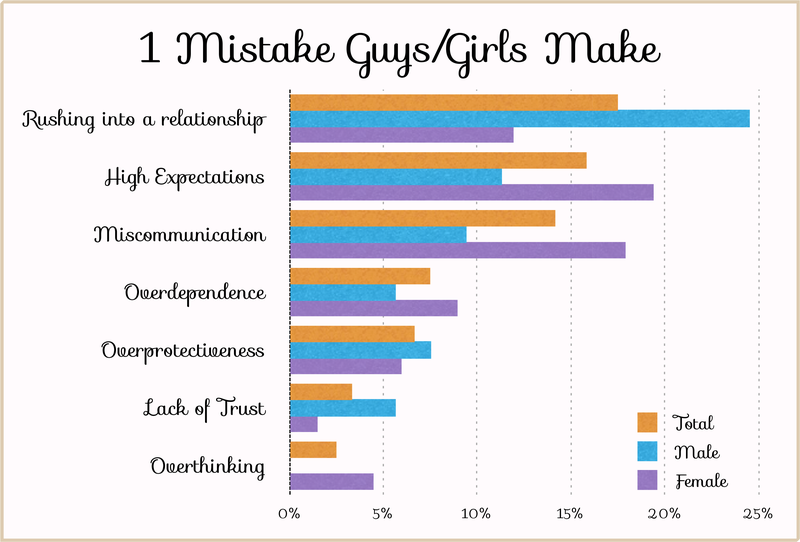 We also asked the respondents about the one mistake they felt that guys/girls tend to make in a relationship. Majority of the female respondents responded something to the effect of “expecting a fairytale-like relationship” as the most common mistake, subsequently facing disappointment when things go sour, leading to an unhappy relationship. The one key mistake that both genders wholeheartedly agreed on was the issue of miscommunication. Supposedly, our respondents felt that overthinking and making assumptions about the other’s feelings were key causes of conflicts and break-ups. It seems emphasising the importance of communication doesn’t only apply in workplace, but in relationships as well. As anyone would be curious to know, we asked our respondents to talk about the one key piece of advice he/she would provide for their potential partners. Responses ranged from serious advice (honesty is the best and talk things out, even if you’re not one to talk or share concerns easily – after all, a relationship should have no secrets) to amusing ones like ‘get me a cat!’ and ‘please exist’. On this romantic eve of Valentine’s Day, Raffles Press would like to wish all the couples out there a memorable Valentine’s Day. We would like to point out that, as one of the respondents cleverly put, “One shouldn’t celebrate their relationship specially just on one day. Every day that you’re together is a gift to be cherished (:” As for everyone else, we wish you a happy Friendship Appreciation Day! Look on the bright side – you’ll be able to get all those chocolates you’ve been eyeing in the supermarket on sale within the next few days!